obscene chewing: re: the lone gunman. So. 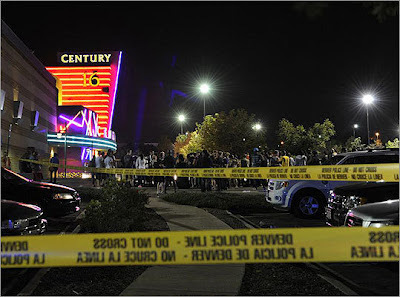 Apparently last night, a twentysomething male wearing a gas mask and a bulletproof vest walked into a suburban Denver movie theater showing The Dark Knight Rises, set off two canisters of tear gas, and then opened fire—killing a dozen people and injuring around four times as many more (according to the most recent reports available at the time of this writing). No, I am not telling you this because I think the news has somehow eluded you until this very moment. (It would be a feat of Appalachian-style isolationism to have avoided the arch-solemnity of newscasters and the glib workplace commentary by now.) I am actually speaking to myself here. When this massacre has been superseded by another massacre, I want to remember which massacre I was referring to. I'm not being snarky; I really want to remember. Matt Lauer, of the Today show, was the one who delivered the news to me. I can't stand Matt Lauer, but something compels me to watch him at times like these. I like to hear what he does with his voice. Usually, when he's delivering 'ordinary news' the inflection of his voice rises and falls like the graph of a sine wave, but at times like these—when tragedies are told (and newscasting reputations are sometimes made)—Lauer's voice always flattens out. It's the kind of a voice a parent uses with a child when the child's grandparent has suddenly died: slow, deliberate, cautious—as if the anxieties of a young child were a dangerous wild animal that one must take pains not to rile. If I had to come up with a physical metaphor for Lauer's solemn voice, it would be an old woman unrolling a ratty carpet. She just lets it fall to the ground as she slowly unwinds it. This certainly isn't a criticism of how news anchors and television hosts must behave when massacres, bombings, assassinations, and terrorist attacks occur. If they acted any other way—more casually, less dramatically—we'd probably get angry or offended. What interests me primarily about the reactions to incidents like these is the shock. Yes, for those personally affected by the shooting, it is certainly shocking, but for the rest of us... those of us for whom the news is almost just a diversion as we get ready for work, something that happens somewhere else to somebody else... is it really all that shocking? What really and truly shocks me, again and again, is how infrequently events like this occur. Now, I understand that you might like to write this off as the ranting of a misanthrope (and I am a misanthrope), but misanthropy has nothing to do with this. Odd as it may seem, I think the first sentence of this paragraph is positive, almost optimistic. The population of the United States of America is 311,591,917 people, as reported by the U.S. Census Bureau in 2011. Let me repeat that: 311 million—almost a third of a billion people. How amazing is it that among all of these people—most of them forced to relate to one another in many ways on any given day—there are not many more incidents of mass killings? Let's think about this. Really think about it. How many people are severely mentally ill in this nation and aren't receiving any help? How many people have nobody—no friends or family—to talk to about their problems (or anything at all, really)? How many people are isolated psychologically from the society they live in—meaning that they have utterly no sense of belonging or responsibility to that society? How many people have no jobs, no homes, no prospects, and absolutely nothing to lose? How many people feel intense rage and resentment at a world they believe has dealt them a bad hand? How many people are desperate for attention—any kind of attention at all—from a world that mostly ignores them—a world that wouldn't notice if they suddenly vanished forever? How many people are addicted to mind-altering drugs which exacerbate their disconnection from society and wear down their moral inhibitions? How many people have been indoctrinated by perverse, nihilist ideologies—racist or anti-government or messianic? I am often astounded that society is as cohesive and ordered as it is. As members of this society, we are profoundly vulnerable—all of us. When you've been driving down a busy highway, you've probably sensed this—that you are trusting that everyone on the road around you will (to some minimum extent) adhere to the rules of the road and that one 'lone gunman' (in the psychological, not literal sense) won't suddenly decide, in a moment of existential abandon, to ram his car at high speeds into the cars around him. Apart from this kind of intentionality, you are trusting that the other drivers on the road are mentally competent to operate a vehicle; you are trusting that one won't suddenly have a heart attack; you are trusting that everyone's vehicles will operate correctly, etc. This inherent vulnerability can be extrapolated to countless other social venues: shopping malls, schools, skyscrapers, airplanes, and—yes—movie theaters. As Socrates might have put it, we are bound up together in some kind of literal and unspoken contract. We are citizens of a specific nation, and we have, intentionally or not, subordinated our personal freedom to the laws of the United States. But also we seem to have agreed to live our lives in defiance of our social precariousness, to trust that things will ultimately work out the way they're supposed to. And the shocking thing is that most of the time we're actually right. This is a pretty life affirming post for someone who pretends he's a misanthrope. I think about that whole out-of-control car thing a lot. Like we have so many little barriers in our lives to protect us from harm but they're mostly useless and provide only a false sense of security. The reality is, most of the time things really DO work out okay.